ART AND PARCEL with the publication of the Campion Missal & Hymnal [url] was the necessity of writing many promotional articles. 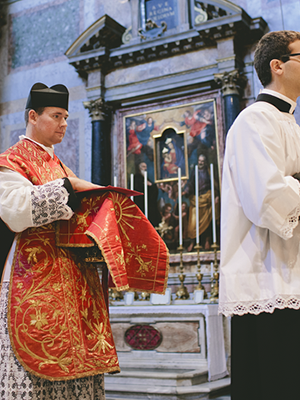 These articles invariably involved much discussion about the Roman liturgy. I think it is probably fair to say that anyone who examines the Campion Missal will soon realize how intimately “bound up” it is with the whole liturgical movement of the twentieth century. Briefly stated, the liturgical movement was an effort to help people in the pews pray the actual prayers of the Mass along with the priest, as opposed to (for example) praying the Rosary or other private devotions. This topic is so vast, I could probably write articles for the next four decades without running out of material. Furthermore, it is a complex issue: it’s not “black and white.” For instance, Cardinal Ratzinger pointed out that while praying the Rosary at Mass would probably not be considered the ideal, depending on each circumstance (and he used the example of his grandmother), praying the Rosary might actually be the most perfect way for that individual to assist at Mass. Let me say again, it’s a complex subject that can be difficult to write about in a satisfactory way. Let me say that again: the article describes the best ways of playing the organ all throughout the Low Mass. Believe it or not, this practice was not rare once upon a time. In France, many “bigtime” organists treated Low Masses as concerts. As I mentioned in my (too lengthy!) Preamble, this subject is complex. We ought not rush to judgement immediately. I think most Catholics would probably agree that playing organ throughout the entire Mass is probably not in keeping with the Liturgical Movement. However, I remember Jeffrey Morse (conductor at an FSSP parish in California) mentioning to me that he has attended such Masses and was quite moved. My advice? Read the article, ponder it, and come to your own conclusions. In some of the publicity pieces I mentioned earlier, I have included articles like this one by Villani, but I must admit that no matter how many of these articles I read, it always strikes me as bizarre to hear organists describing, for instance, what stops to use during the Gospel. Note that Villani even quotes the Ceremonial of Bishops with regard to what type of music ought to be played during the Elevation . . . Speaking of Caecilia, it really was a well-produced magazine. It was not easy to print a monthly periodical during the Depression, yet they did. However, “all that glitters is not gold.” Not everything is the Caecilia is all that professional. For example, look at this 1935 biography of Fr. Franz Witt [pdf]. They make a big deal about it in the Table of Contents and . . . it’s literally a sentence long! Oops! I guess they said everything they needed to about Rev. Witt in that sentence . . . It reminds me of a sermon we once heard at a Latin Mass (Diocesan Indult) many years ago. The priest came to preach the homily, and he said something like, “So, my children, we must always strive to adhere to the Catholic Faith. What is the Catholic Faith? Read the Catechism: it’s all in there.” And that was it! That was the entirety of his homily! Incidentally, Fr. Franz Witt, a Catholic priest, was friends with Abbé Franz Liszt, and I believe they dedicated pieces to one another.